Watching films about Alzheimer's Disease isn't always an easy task. My grandmother has been in a nursing home for 8 years now with the disease, unable to speak or walk. I know what it is like, I have seen it. And these films tend to hit close to home. 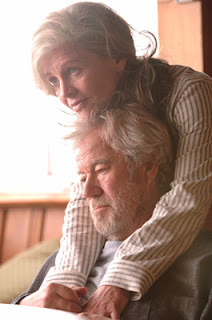 Such was the case with Away From Her, actress Sarah Polley's tender and charming feature directorial debut, in which Gordon Pinsent plays a man coping with his wife's (Julie Christie) illness and deterioration from Alzheimers, as he watches her forge a deep connection with another man in her nursing home. It is a unique and unexpected premise, and through the earnest performances of its two leads (especially Christie, who is simply luminous), it works perfectly. They are aided by a crisply written screenplay by the director herself, adapted from the short story The Bear Came Over the Mountain by Alice Munro. What makes the film such an unexpected knockout, however, is its refusal to go for the obvious. This is not the best film to deal with Alzheimer's I have seen (that title goes to Richard Eyre's Iris, with Judi Dench giving the most stunningly accurate portrayal of the disease ever put to film), but it earns many of its points for taking the road less traveled. It does not wallow in the sadness of its story, but focuses on the positive. And it does not end it tragedy and death, it ends on a positive note, in a moment of recognition, a bittersweet glimmer of what once was. We know were the story will inevitably lead after the last frame has faded away, but we are sent away with hope, a poignant reminder of the power and pain of love. Much of the praise surrounding the film has focused on Christie's performance. And she is indeed luminous, often managing to seem both spirited and vulnerable at the same time. Her moments of normalcy make the moments rob her of herself that much more painful - to see such a strong personality suddenly become lost in a world it no longer recognizes or understands. Polley displays a keen understanding of the sense of confusion and loss that goes along with Alzheimer's, and she handles it well, guiding the film with a warmth, humor, and heart that takes a fresh approach to a very serious subject. Away From Her is a film that earns its tears honestly - and by presenting hope in the midst of despair, light in the midst of darkness, she has painted a portrait of Alzheimer's that rings painfully and beautifully true.